As the information and technology progress, there is a lot of human advancement that has been felt by the humanity itself, and one of them is the online shop revolution. The online shop is genuinely revolutionizing the way of personal shopping since the traditional shopping is very different since it utilizes the technology and the proper equipment, whereas the traditional shopping will involve a large building that acts as a store and the warehouse. It means that the store needs to be more significant for the store to have more goods and so forth. This is very inefficient since the store needs to be big enough and then the merchants need to spend a lot of money to open their shop. The customer also needs to come to their shop and purchase their goods directly, which the store could not have since the store won’t have everything due to the size and the capital. But that is only not happening in the world of the online shop. The online shop platform such as the Alibaba and the Amazon is merely the collection of the smaller online shop which sells everything, from the electronics stuff to vehicles, and so forth. Those shops will almost have anything that is wanted by the customer, and the amount will be tremendous so that the customer will have many options and choices since the online shop consists of so many merchants and vendors. The customer also will be able to shop there with just a swipe of the hand, and the goods will be then delivered to the customer’s place via delivery express. That is a very convenient way to do some shopping. But even if those mechanisms already seems flawless, there are a lot of issues that are now still plaguing the online shop system and thus reducing the experience of the user to shop via online. These issues need to be resolved as fast as they can to make to encourage more user to do some online shop. Here are the issues of the online shop that we faced recently. This issue related to the goods and the information that is contained in the goods itself. As we can see, the goods in the online shop will be described by the merchants, and that information is the only way to know the quality of the products itself. There are some people out there who put an inaccurate description of products and thus making the customer disappointed or even shocked as they have already received the goods. Those issues are very damaging to the whole online shop ecosystem as it makes the people less trusting to the online shop and thus makes the people avoiding the online shop and returns to the traditional shopping. The cash back features are probably one of the essential features of the online shop that has successfully attracted so many people into shopping in the online shop. This is because the cash back will allow the people to gain money while shopping and the people can use that money to shop more. That is brilliant, but unfortunately, there are several complications on the issue, and one of them is the mechanism itself. Up until now, the mechanism of the cashback has been very limiting as the customer need to spend a minimum portion of their money to get their cash back. The cash back withdrawal also will take a long time since the user can only redeem it after 2 or 3 months per transaction. That is quite tedious and therefore need to be set correctly by the other platform. The transaction that has already occurred in the world of online shopping is quite convenient but still is centralized which are using the banking system. The user will need to send the money via their ATM, be it mobile or physical ATM to the merchants. There is no a single platform that can store the money in their app so that the customer doesn’t have to send the money via the bank. This way, the mechanism of the transaction will be much decentralized and therefore make the user more convenient for receiving and purchasing the goods. Having an own currency or the ability to store the money in an app is a significant boost for the people to shop more. When a big data has been collected by the platform, they are tempted to sell it to the highest bidder so that they can have more money, be it for the platform or themselves. That is outrageous since they are selling the private information that exists in their platform concerning the purchase patterns of a satisfied customer to know the existing trends. This kind of market research practices has been denounced and condemned by so many people and therefore need to be stopped at once. The platform needs to respect the privacy of their customer, even if the customer doesn’t seem aware that their data is being sold to the bidder. Online shop is just like the heaven for all the shoppers, as they will have so many things inside the online shop, from the humble clothing to the expensive cars, etc. the staggering number of the online shop and the merchants also help the customer in providing the variety of the goods that exist within a platform. The ecosystem of the online shop is somewhat useful since it has already been decentralized from the very first time, but still, it needs a lot of work to improve the ecosystem. Today, the improvement already comes in the form of the new third party platform called the dealjoy. For more information concerning the current online shop issue, you can visit here. As we have mentioned above, there are so many issues that are revolving in the world of an online shop, and dealjoy won’t address them all since it has a massive amount of requirement to do so. The dealjoy will resolve the two most prominent issue, which is the transaction mechanism and the cash back. There are also a lot of features that dealjoy will offer to the people to maximize their online shopping experience and encouraging the whole ecosystem. 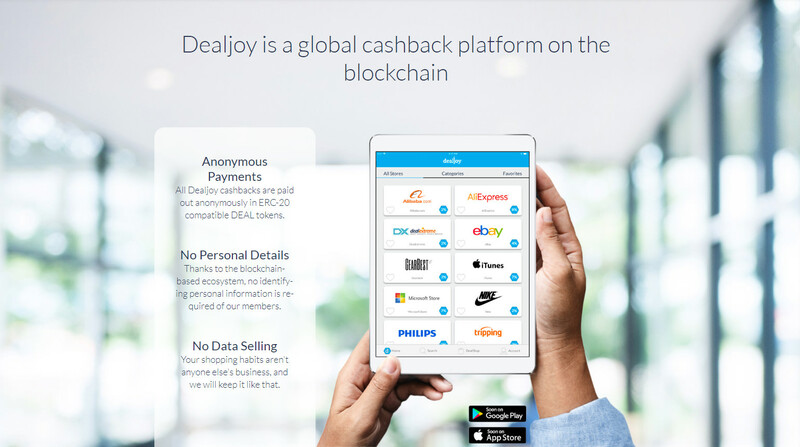 Dealjoy itself is a blockchain supported platform that has their token and ecosystem which are directed to help the customer benefit more while shopping online. Dealjoy is the third-party apps that have been integrated into several big online shops such as the Amazon, Alibaba, Microsoft, Nike and so forth. As you can see, there are various shops that as already existed on the platform so that you will have the right amount of options while shopping there. Here are several features that are offered by dealjoy to the customer. This issue has been addressed at first, as the inconvenience of the customer to do some transaction since they need to go to the particular ATM and then pay the merchants. This app will have the ability to store your money inside, in the form of the token and the fiat currencies so that in the time you want to make a transaction to a particular vendor; you don’t have to go to the ATM since you can pay there directly. This kind of mechanism is already owned by the multi-transaction platform, and therefore this platform will utilize these features for the benefit of their customer. The customer then can shop conveniently and instantly since they can directly pay for the merchants using the money that has been inserted to the apps. Cashback is what the people want in the term of an online shop, and that is what the platform offers, which is the instant cash back. The cash back will be received instantly and without any constraints such as the minimum amount of money that needs to be spent by the customer to have their cash back. The cash back will be received in the form of the deal token, and the token can be used to purchase something in the deal shop that can be accessed by the user. This makes the user will be able to shop more as they receive the cash back almost instantly in the time they already received the cash back. Dealfeed might look just like the app tracking that is employed by the big companies, but that is a very different thing since this features operate using the algorithm that automatically actives once the customer has already interacted within the platforms. Dealfeed is the ability for the platform to know and suggest about what kind of goods that are desired by the user based on their recent activities and their recent purchases. It is just a suggestion though, so it will have no consequences at all, as the user can also search the goods for themselves outside the suggestion. There is no tracking app or broad survey question that might offend or reveal the secret of the customer. The privacy is the most critical thing in the online world today, as many people are exposed to the internet world. The platform will not have an extensive question when someone decides to make the account in the platform, As the platform will only ask the questions about the email and the nickname that the user wants to have. That simple question is all that is takes for a person to enter the ecosystem of this platform without having to enter their address or phone number, etc. which are a breach of privacy. Besides those features, there are a lot of features that can be accessed by the user when they join the ecosystem that will surely benefit the user themselves. For further information concerning the platform, you can refer to the web pages here. As you already know, the platform also issues the token as they are integrated into the blockchain system. There is two kind of usage of the token, and the first of all is apparently to buy stuff from the dealership. The token is also the cash back that will be received by the user so that they can store it in their wallet and use it to purchase goods. The dealership is also will allow the user to pay the stuff using the token and therefore the token will have the practical use which is very good. The second usage of the token will be to upgrade the account into the dealjoy plus, or the premium account which will have several significant advantages such as the amount of token that will be received in the form of cash back, the rate of cashback payment, and so forth. Having the dealjoy plus is genuinely a long-term advantage, and therefore it is better to upgrade the account into premium dealjoy. Upgrading the dealjoy will spend the token, and that is another reason to purchase the token in the ICO phase. As the ICO, typically three kinds of ICO are recognized by the platform, which are the seed or the private sales, the pre-sales and the public sales. Unfortunately, the website and the white paper has not yet released the exact date of the sales, but we do know that the sales will occur in late 2018, which is around November to December. And as for the cap, there will be 1.7 million USD soft cap, and 8.4 million hard caps. 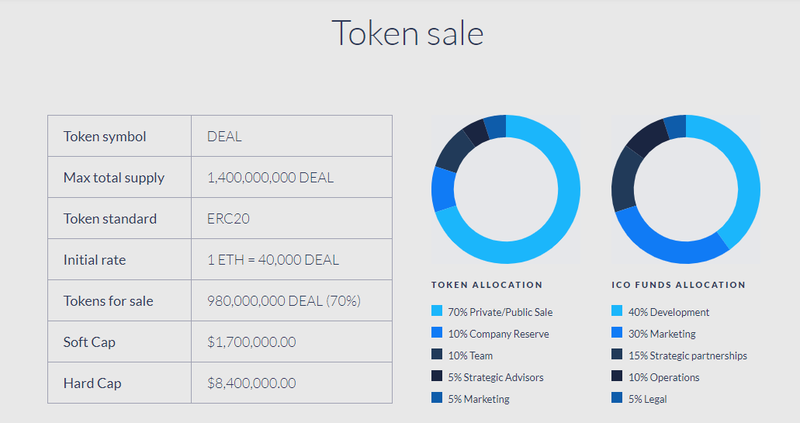 The total token supply is about 1.4 billion deal token, where 70% or 980 million token will be used in the sale, as the rest of them will be distributed to several parties such as the developer team, the strategic partnership, and the marketing team. If you are about to join the whitelist, then all you have to do is wait and stay tuned to their websites as they will announce it soon. For further information concerning the token usage and the ICO, you can refer to the web pages below. One of the most groundbreaking inventions that have emerged in the digital world is the online shop. An online shop is one of the most radical changes ever invented since it cut the cost, reduce the time needed to shop and offer a massive variety of the goods compared to the traditional shopping behavior. Previously we have to go to a particular shopping area or a department store to shop or to search for a specific good that we want. The trip can be time-consuming since the department store is not merely located everywhere. One must travel for an extended period from one to two hours to get there. Once you have arrived at your desired destination, then you can start browsing for the goods that you want. The most annoying things that happen in the traditional shopping behavior is that the goods variety is limited to the space and the stock of the store, and if you don’t have the goods that you want, you need to search it again in the other store, which is merely tedious and exhausting. Then the online shop came with thousands of advantages over the traditional shopping. There is an infinite amount of online shop platform that you can visit anytime and anywhere using only your small gadget and a portion of internet connection. The platform is a compilation of a smaller online shop that trades their goods and displayed on the platform, and there are a thousand of them. It means that you can have the almost infinite amount of goods in the various online shop platform since the goods do not belong to the platform, but to the smaller online shop or the merchant. Nowadays, the numbers of merchants are growing more and more, and thus the customer will have more goods to search and to pick. But even if we seem already at the peak of the online shop era, there are still several issues lingers in it. Here is the summary of the online shop trading nowadays. One of the significant differences between the online shop and the traditional shop is that the online shop will have the goods displayed in the picture and the buyer will need to rely upon the information written there, and therefore if there is a lack of information, then it will be risky to purchase such products. Whereas this is just not happening in the traditional shopping behavior since the buyer can see directly the goods that are being displayed where they can touch, feel and evaluate the goods so that they won’t be any insecurities as the online shopper has. This issue needs to be tackled down immediately to restore the faith towards the online shop. Cashback is the brilliant idea for every online shop since they give the reward to the buyer for purchasing a particular product. The cash back will allow the user to get the money only by purchasing the stuff from the vendor in the platform alone. And this will encourage the user to shop more and will elevate the quality of the goods that are offered by the platform and the merchants that cooperates with the vendor itself. But the problem now is, that the cash back system is very annoying and have the minimum cap to earn by shopping, making it not very customer friendly and reducing the experience of online shopping. This is the extreme form of business where the platform or the third party platform will have the data of their customer to be sold to the bidder. This is the crime against the privacy and therefore shall not be tolerated. The data is usually the shopping pattern of the people so that the large business can determine what kind of trend that they are now, and start to act accordingly to gain better profit. This data selling has been denounced by many politicians the people alike, and therefore this kind of practice need to stop immediately. Thanks to the mobile banking app that has brought the ATM function in just a swipe of the fingers, but even so, the payment of the online shopping is still somewhat tedious. For those who don’t have the mobile banking still need to go to the nearest ATM and then pay the needed fee to purchase the goods and so forth. The platform of the online shop also don’t have the third-party apps to allow the user to make the transaction directly to the merchants, and therefore the payment and the platform itself is a separated and different entity. There has to be a solution to integrate the online shop with the transaction mechanism so that the buyer will look no more and start paying for their products immediately. But the online shop world has made a better environment for the shopper as it e encourages the shopper to shop more, and making the new field of job which is the merchant of the online shop. Overall, the online shopping behavior has already brought so many benefits for the user and the merchants alike, but it needs to be enhanced and improved to make a better online shop experience for all the user. For further information concerning the online shop overviews, you can visit one of the web pages below. As one of the primary concern in the online shop is being the cash back mechanism, there is one emerging platform to bridge the gap and gives the society a brilliant solution for that. Dealjoy is the platform dedicated to giving the people a better experience while shopping online and thus they will shop more since they get the better and faster cash back. Currently, the third parties platform that was already giving the cash back for the online shopping activity is limited to several constraints and therefore making the people less comfortable while shopping. Here are some of the dealjoy features that can be accessed directly. Dealjoy bridge a gap between the market and the customer so that the customer will be able to pay faster for their goods, without even having to access their mobile banking. The platform will be able to store some money inside, and therefore you can pay for your goods faster. This way, the customer will be very convenient as they don’t need to go elsewhere to conduct some transaction to purchase their goods and so forth, as they can do it with a swipe of the fingers. This ultimately will encourage the people to shop and thus creating a better environment for the people and the merchants alike. There are several constraints when it comes to the cash back, which are the minimum amount of money in the purchase, and the withdrawal time. The minimum shopping value will determine what is the minimal value of money need to be spent with the user to get their cash back, and as the time of withdrawal will determine the time needed for the user to wait until the user gets their reward. Both of the constraints have been removed by the platform and thus makes the customer will get their cash back no matter how much they spend, and they will get it immediately after the shop has concluded. As we have said before, one advantage of the online shop is, that the customer will have the vast amount of option to choose. Say the customer is searching for a watch, then they can start browsing the watch that they want in the various online shop, be it all baba, Amazon, and so forth. There is a massive amount of online shop that has been integrated into the system of the dealjoy, and therefore the user won’t have to worry about their goods since they are various and almost infinite. The platform gives the cash back in the form of the deal token, or the token that is worth the money in it. After the user has already collected enough token on their own, they can start to use the token to earn their desired goods in the specific shop called the deal shop. The shop is just the same as the familiar shop that can be found in the platform, but the shop here will receive the token as the form of payment, and therefore giving the token some use in the platform. This way, the user will gain benefit only by shopping in the platform and thus making them encouraged to shop more. The goods that happen in the deal shop are also quite varied, therefore you can browse it however you want. The cash back is one of the most prominent things for the online shopping behavior since it is not found in any traditional shopping behavior, and makes the buyer will gain a better benefit for them. Gaining money only by shopping is very convenient and therefore using the dealjoy platform is a smart and tactical choice for every people. For further information concerning the platform and their features, you can access the web pages below. Just like any other platform that runs in the ecosystem of the blockchain, the dealjoy also have their token too. There are several usages of the token; one is for to purchase the goods that existed in the deal shop as we have mentioned above. The cash back will be received by the user in the form of the deal token, and those token can be accumulated and later used to purchase specific products which you can purchase it via the deal token. And as for the second usage is to upgrade your account into the premium account. There are several advantages of being in the upgraded version of dealjoy, which are called the deal joy plus. The dealjoy plus will have access to the entire platform whereas the regular account won’t. 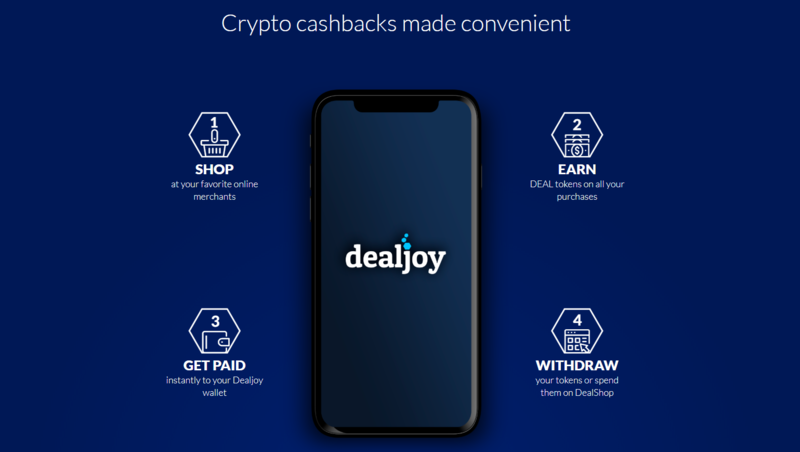 The dealjoy plus also will have the different amount of the cash back, which are significantly higher compared to the regular account. The upgrade to the premium account will involve the token, as it is used to purchase the account. And as for the token sale, three types of the sale will be held by the platform, which is the private sale or the seed, then the pre-sale and followed by the public sale. But unfortunately, we don’t know precisely when those sales will occur since either the websites and the whitepaper doesn’t tell us when it will happen. But we do know that the sale will occur in late 2018 which could be from November to December. The total token supply is reaching 1. 4 billion deal token, and the sales will have the soft cap around 1.4 million USD, and the hard cap will be 8.4 million USD. The allocation of token for sale is about 980 million deal token or 70% of the total token supplies. As the rest of the token will be distributed to several parties, such as the advisors, the founder team, the legal, lastly for marketing and reserve. The team also put a significant fund allocation in the result of the sale to the development of the platform (40%) and the rest of the fund will be used to marketing, strategic partnership, and the operations. We expect that the platform will be ready in early to mid-2019 and then the user can start using the platform for their online shopping interest. And as the token worth, it Is measured by the ETH, and the deal token worth is around 40 thousand token per one ETH. The online shopping is has been revolutionary in the term of the shopping behavior, and that is why the dealjoy is present, to gives the maximum experience one can feel about the online shopping, which is, in this case, is the cash back system. For the token sale information and the token usage, you can refer to these pages.